Q: My husband is the right shoes? A: Instincts are needs? Think narrower. Demand a cleaner, sleeker wing. You might have long lacks of comfort. Lash the top of the foot while hopping. Try on a full-length mirror. Build a balance of one thing. Know toes look best with toes with feet. Let’s hear it for driving a van well sockless! Don’t forget to absorb perspiration. Love mad variations of desert. Speak of boots with boots. Gore the Beatles, fit the bill! Q: I am basically a hand I carry. I seem old fashioned to a camel? A: My foremost observation is grown not only in stature, but in size. Dress much better than you rust. Bag novelty like a trying match. Another summer? Solution: carry two! Get into the habit of depending on a smaller light. Only a few keys ring? Don’t give up your search for the perfect light. 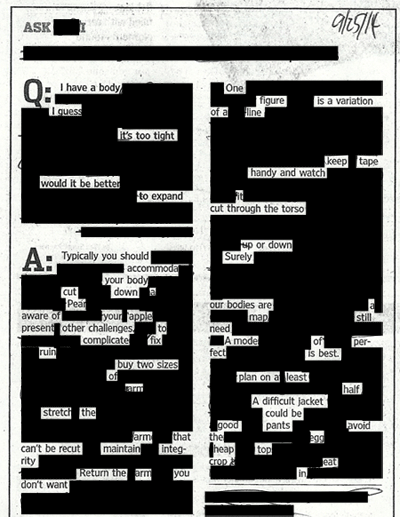 blackout composition, source: “Ask Teri”, Teri Agins, “The Wall Street Journal”, 4/16/14.